As a consequence of wonderful success at branch/division/Circle level programme and also as because a dharna has been scheduled at Postal Directorate tomorrow on CBS/CIS issue, Member (P) and Member (Banking) invited Com. R. N. Parashar, General Secretary to meet them today and subsequently meeting held. 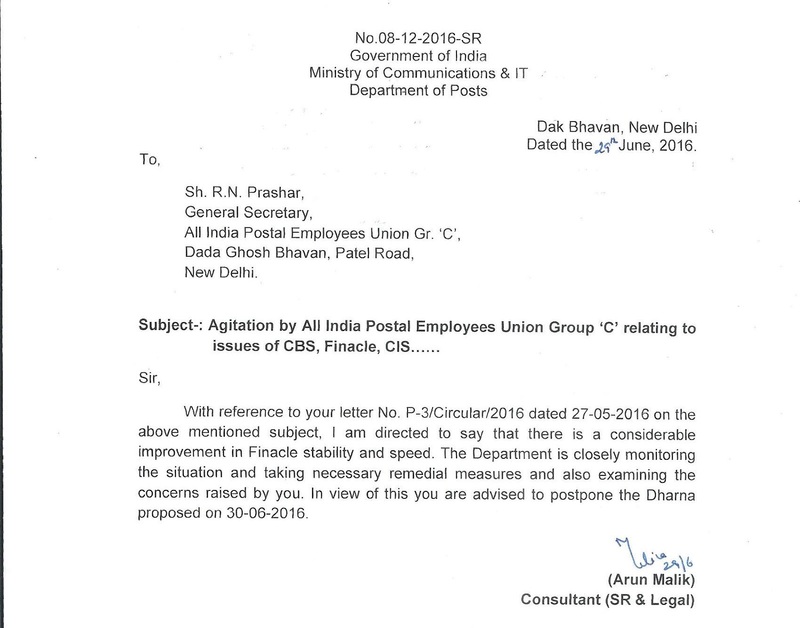 Based on assurances and appeal by Member (P) & Member (Banking) to readdress all the problems as soon as possible related to CBS/CIS & Finacle, Dharna/Demonstration in front of Dak Bhawan to be held on 30.06.2016 postponed. We are also getting some positive feedback/report from Circle/Divisions. There are some improvements in CBS/CIS and Finacle problem in some areas. Some areas are still left with pains which are also to correct. So comrades, please intimate the position of CBS/CIS in your circle to take up with Postal Directorate accordingly.